International's Snagging Wheels are manufactured for a wide use of heavy stock removal in foundries, welding shops, metal fabricators, steel mills, shipyards etc. International offers a complete line of engineered snagging wheels of high performance and many types such as Straight Wheels, Flaring Cups, Cones and Mounted Points. 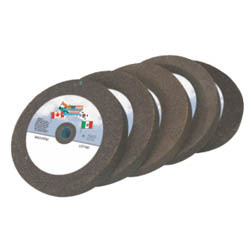 International Centreless grinding wheels have versatile application in bearing, auto and auto ancillaries, cutting tools, stainless steel bar, fastnerand other general engineering.